Recruitment of 13357 Posts in TS TRANSCO, TS GENCO, TS SPDCL, TS NPDCL Govt Jobs in Power sector. Recruitment of Telangana Govt energy department 13357 Posts in #TRANSCO, #GENCO, #SPDCL, #NPDCL. Recruitment of Telangana TSPSC-13357 Posts creation in ENERGY Department in TS -TRANSCO, TS-GENCO, TS-SPDCL and TS-NPDCL Orders Issued. G.O.Ms.No. 76 Dated: 06-05-2017 . Consequent on formation of Telangana State, Government has accorded priority to the power sector for addition to power generation and providing uninterrupted power supply to all sectors. In consonance with the priority of the Government, the TS TRANSCO, TS GENCO, TS SPDCL and TS NPDCL have taken up necessary ground work for capacity addition and also assessed the requirement of manpower. Accordingly, the Energy Department, in the reference read above, have submitted proposals for creation of additional posts duly mentioning the requirement in the respective power utilities, in a phased manner. 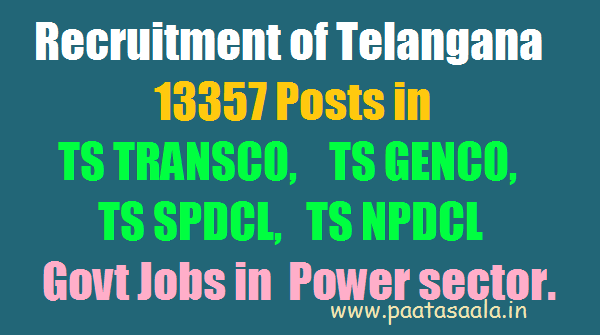 Telangana Govt 13357 Posts Recruitment in TS TRANSCO, GENCO, SPDCL, NPDCL Govt Jobs in Power sector. TS TRANSCO to fill various category posts through Direct Recruitment: TS TRANSCO to fill various category posts. Government of Telangana has accorded sanction for creation of (3441) posts in various categories in the TS TRANSCO Power sector. For more details of Syllabus, Online application, Eligibility Creteria, Qualifications TS TRANSCO Recruitment Web portal: http://tstransco.cgg.gov.in/ TS TRANSCO Official Web site: http://transco.telangana.gov.in/index.html .